Stunning handmade glass wall clock. 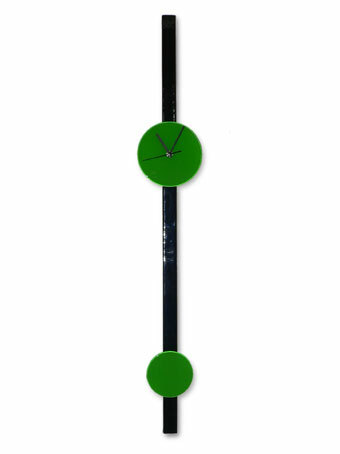 Set with a long slim black glass piece set with 2 round retro green discs.....the vibrant green contrasts brilliantly with the black. Width of the clock face is 14cm, the lower disc is 10cm and length is a very long 90cm. This clock is induvidual and handmade so is sure to draw comments from everyone who sees it!